En.4yendex.com – How to remove? 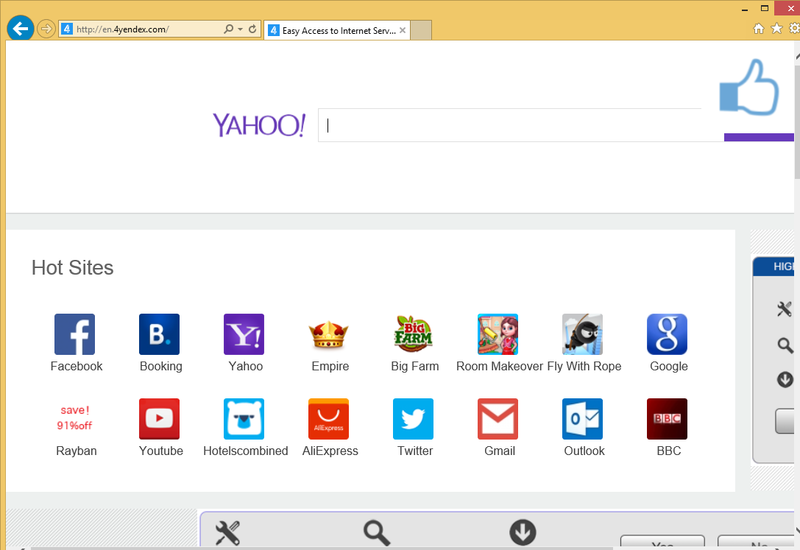 If En.4yendex.com appears on your screen each time you go online, it means you are dealing with a browser hijacker. Fortunately, browser hijackers are not malicious, so your system is safe for now, but you should know that keeping them installed is never a good idea. The goal of any hijacker is to generate web traffic. This means that it will expose you to various advertising data. The problem with the adverts is that they are not monitored by anyone and could be fake. Not to mention that they slow down and disrupt your surfing. The hijacker comes with other bothersome symptoms that will be discussed below. There is no reason for you to hesitate to remove En.4yendex.com from your browsers as there is nothing useful about it. It is most likely that the hijacker entered your PC through a freeware bundle together with an ad-supported program. If you do not pay attention to the installation of free software, you will acquire potentially unwanted apps from time to time. It is important that you always decline the additional offers during the installation process no matter how useful they may seem. Once inside, the hijacker alters your browser settings. It changes your home page and default search provider to En.4yendex.com. The website does not look that much different from other search portals, however, it may contain fake ads. If you make use of your new search engine, you may get presented with suspicious sponsored links as well. In addition to these modifications, you will notice various advertisements on all visited sites. Pop-ups, coupons, banners, and other types of ads will interrupt your browsing. Worse than that, they will expose you to unsafe content, clicking on which may result in troubling consequences. You may infect your computer with malign apps, waste your money on bogus software, and so on. If you wish to make sure that does not happen, you should terminate En.4yendex.com as soon as possible. In order to delete En.4yendex.com from your browsers, you will have to choose between two options: manual or automatic removal. Manual removal is not as effective, however, if you follow the instructions below, you should be able to get rid of En.4yendex.com. First, you will have to uninstall its related application and then fix your web browser preferences. Alternatively, you can go with automatic En.4yendex.com removal. It requires you to use an anti-malware utility. You can implement the security software from our page. It will perform a full system scan and detect all unreliable elements. The malware remover will then erase En.4yendex.com and other threats that it detects. Moreover, the utility will stay beneficial to your online safety by protecting your PC from various Internet-based infections in real time.